We are on the verge of a major world event. The current situation with Europe's banking giant Deutsche Bank is not something to be taken lightly. 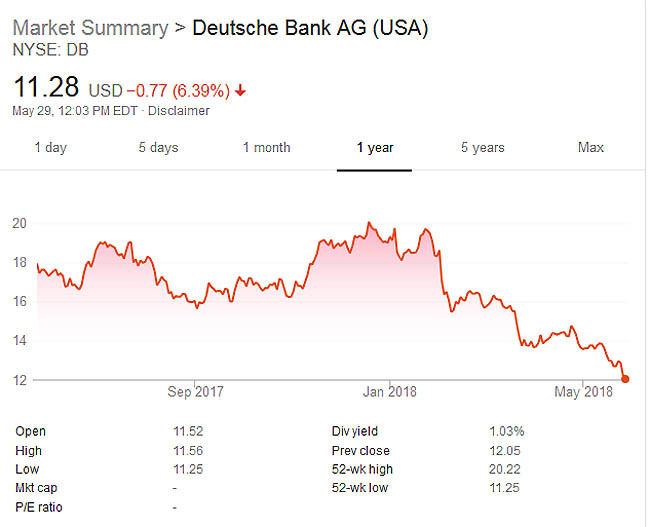 I have had a close eye on Deutsche Bank's stock over the past year, which now appears to be unraveling rapidly. Deutsche Bank is the world's 4th largest bank which just laid off 10,000 employees this past week. Their stock is now plummeting sharply today, down 12% just in the past two days alone, along with its revenues. News sources report, "Deutsche Bank Has Credit Default Swap Exposure of 2x Global GDP." If marketeers run on the derivatives book, nothing will be able to save it. This would be a high impact event. 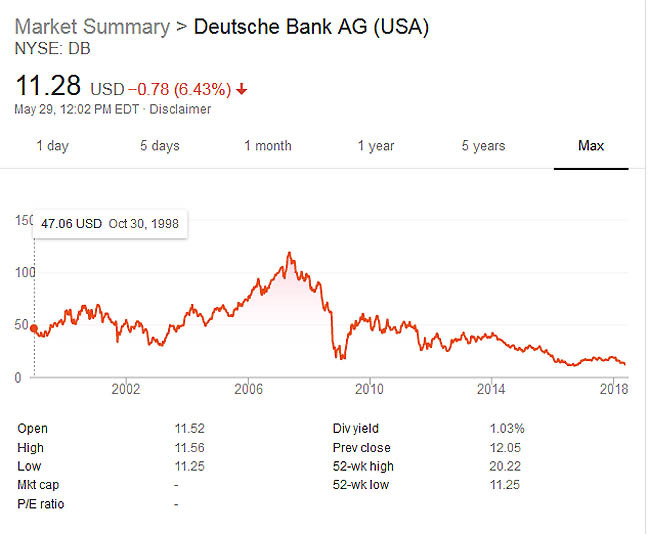 Before the 2008 crisis, Deutsche Bank's price was a $120.00 a share. You may remember that the 2008 panic began when Lehman Brothers' stock price broke below $10.00 a share. Today at $11.27 per share, Deutsche Bank stock is $6.00 lower than it was after the 2008 credit crisis. We could see a full blown stockholder panic if and when the stock breaks below $10.00, which was the Lehman Brothers' stockholder panic trigger. Deutsche Bank carries enough derivatives to collapse the entire financial system. How big would the impact be to the U.S. and global financial system? Twice as big as Lehman Brothers. In the face of a purportedly stronger stock market, we now have one of the largest financial institutions in the world rolling over and falling to within pennies of record lows. Like Lehman Brothers, Deutsche Bank could fall overnight. Do you own wealth insurance? Buy gold and buy silver, before it's too late! Gold prices increased by 110% after Lehman Brothers collapsed - and gold was the only asset class that did increase!